Relief pitcher David Hernandez has 63 holds since joining the Diamondbacks in 2011. FOX Sports MLB Insider Ken Rosental reported Friday morning that Diamondbacks relief pitcher David Hernandez has a torn ligament in his pitching elbow, according to his agent, Jason Hoffman. More bad news for #DBacks: MRI shows that RP David Hernandez has torn UCL, according to his agent, Jason Hoffman. Will get second opinion. If second MRI confirms torn UCL, Hernandez will require Tommy John, costing #DBacks valued reliever. Was up to 95 mph in most recent outing. A team official confirmed to FOX Sports Arizona that Hernandez is seeking a second opinion before deciding on the next steps. This could be the second blow to the Diamondbacks pitching staff in two weeks, coming on the heels of Opening Day starter Patrick Corbin being lost for the season after Tommy John surgery. Hernandez has 63 holds since joining the D-backs in 2011, tied for the fifth-highest total among National League relievers. A hold for a setup man is determined using the same criteria as a save for a pitcher who finishes a game. He is the third Arizona reliever with 60 or more strikeouts in three straight seasons, joining Byung-Hyun Kim (2000-02) and Jose Valverde (2005-07). Without Corbin and Hernandez, the Diamondbacks’ pitching staff is in a bit of flux. 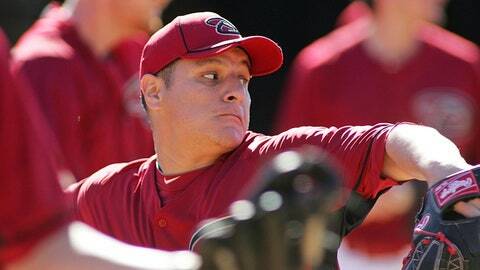 Assuming Randall Delgado moves into the starting rotation to join Wade Miley, Trevor Cahill, Brandon McCarthy and Bronson Arroyo, the D-backs could open the season with the expected seven bullpen arms — closer Addison Reed, setup men J.J. Putz and Brad Ziegler, long reliever Josh Collmenter, left-handers Oliver Perez and Joe Thatcher and middle reliever Will Harris. In another scenario, right-hander Bo Schultz could remain on the 25-man roster if the D-backs open with 13 pitchers, both as an extra bullpen arm and as a possible starting candidate if the D-backs believe Arroyo needs a little more time for his back to fully heal. Arroyo’s Saturday start against the Cubs will be a good test. Schultz was named to the 25-man roster for the season-opening series against the Dodgers in Australia and made his major league debut with a shutout inning in relief in the second game. The Diamondbacks will have a week or so to play with their final roster spot while Cody Ross remains on the disabled list. He is eligible to return April 4, but the D-backs will proceed with caution.